aReJay Ella, who is based in Bergenfield, New Jersey, began his relationship with music at a young age on the violin. So far in his career as a singer-songwriter, he has released three records — Love Music & You, his debut EP in November 2011, Feels Like Home, his first full-length record in February 2014, and Somnium, his second EP in January 2016 — with a total of 21 songs, all produced in collaboration with music producer, Jesse Barrera, in Jesse’s production studio in San Diego, California, known as The JB Cave. 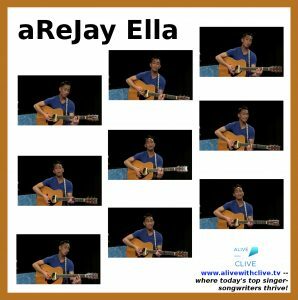 aReJay’s voice has an elegant and soothing quality that generates a sense of peace for all who hear it. When you listen to his songs, you might at first get the impression with some of them that he is singing about the impact of his relationship with someone he knows personally, but when you listen more closely you realize that he could be singing about his relationship with a Higher Power. If and when you listen with that possibility in mind, the songs take on a whole new dimension. Furthermore, a distinctive theme running through “Brave,” “Believe” and “Polaris” is to have the courage to stay true to your core essence, no matter how daunting the challenges you face on that path. aReJay has also had the honor of opening at the Bergen Performing Arts Center in Englewood, New Jersey, for Asia’s Songbird, Regine Velasquez, who has been hailed by the Philippine Association of the Record Industry (PARI) as the Philippines’ Best-Selling Artist of All Time. Fans of John Mayer, Death Cab for Cutie, Daphne Loves Derby, City and Colour, Simon & Garfunkel, and Paul Simon, who aReJay lists as influences, as well as fans of Justin Bieber and Shawn Mendes, are sure to find his sound appealing. And after you discover, connect with and become inspired by aReJay Ella in his 1st Show and 2nd Show on Alive with Clive, you’re sure to find his sound appealing too.